Hey folks! The winter collections are starting to roll out, and today I wanted to show you the 16 piece collection from KBShimmer for the upcoming season! This collection is filled with something for everyone, some shades are wintry, some are holiday-esque, and some are just really great colors! Take Me For Granite is a pale grey crelly inspired by the first snow of the year, covering the asphalt with shades of white, gray and specks of black. This formula was great, like all KBShimmer crellies, let's be honest. You could use two coats, or three for a more opaque base like I did. Spruce Things Up is a holiday green jelly polish with tons of micro holo and sliver glitters. Some of the glitter almost looks gold too, very blingy Christmas-tree looking. I used three coats here. Easy to apply, dries gritty so you'll want a thick top coat. A Walk In The Park-a is a mid-tone orchid purple crème. This has a fabulous one coat formula, although I always use two. I definitely would rock a parka or a cozy sweater in this color, so cute. Have A Look-Ski is a muted teal linear holographic. This is a slightly dusty shade for such a firey holo, more blue than green, kinda ocean/lake-y water color. Excellent formula, two coats. Haute Mess is a mix of silver, copper, rose gold, and holographic glitters in a clear base. You could layer this or build it up on it's own, as I've done here. This is only two coats, it's super dense and full of glitter so it was very easy to get total coverage. I love the mixed metal look! The Holy Kale is a green linear holographic with added micro glass flakes that shift between blue and pink. This started a bit sheer, it was right on the edge of being a two coater, but I thought it looked better with three. The shimmer has a very vivid shift, which gives it an interesting pop. Ornamentally Flawless is a jewel toned glitter polish in shades of turquoise, fuchsia, gold, green and sliver in a clear base. I chose to put one coat over A Walk In The Park-a, but this is also super dense so it could be full coverage on it's own easily. I found the clear base dried crazy fast too. Yeti Or Not is a very pale gray, almost white, polish loaded with iridescent and holographic glitters that glisten like "fresh fallen snow." Almost the same finish as the KBShimmer Mega Flame line, just a touch thicker. You can wear this alone for a textured finish, or use a thick layer of top coat or two to get a smooth, sparkly look. I built this up in three coats with a top coat. Chai-huahua is a warm, brick red crème inspired by the spices that make up a chai drink, cinnamon, cloves and anise. This was super close to being a one coater, but I needed two to get the color you see in the bottle. This is a little bright in my shot, as I take photos in full sunlight, in other lighting it is a little darker and a bit more brown toned. Ink Again is a super vibrant ink blue linear holographic. I can't even say anything about this, it's just SO GOOD. Two coats. Whiskey Business is a warm, golden yellow with metallic flakes and a scattering of micro holo glitter. If you liked the Birthstone collection, you will love this! The formula was literally effortless to apply, opaque in two coats. Royal To A Fault is a royal purple filled with micro glass flakes that shift from blue to violet at different angles. I was pretty blown away by this, and I usually don't go for blurples. Good formula, seemed a little sheer on the first coat, but after I used a bit of a thicker second layer it reached full coverage. Get To The Poinsettia is a red linear holographic. Awesome holiday red, super fiery holo, and smooth as silk. Two coats here. Soot and Ladders is a black jelly filled with micro flakes in a rainbow of colors, inspired by Christmas lights. This has a thinner formula, but was very easy to work with. I used two coats here. Just Duvet It is a rich grape purple, almost a metallic but not quite, with a sprinkle of holo sparkle, and a dusting of pink shimmery flakes. Another impressive purple, great formula and opaque in two coats. Bling In The New Year is made up of a base of silver metallic flakes and silver holo glitter with accents of colorful shifting flakes in pinks, greens, gold and blues. This is also in the Birthstone finish, lovely to apply though I found it ever so slightly runny, so be sure not to overload your brush. This collection will be available for sale on Tuesday, November 1st on the KBShimmer website for $9.25 each. Two shades from previous year's winter collections, Holly Back Girl and sELFie, will also be available for purchase. International folks can purchase from Harlow & Co., though I don't have a date for their release. There will be some excellent gifts with purchase available from 11/1 - 12/31/16 or while supplies last on KBShimmer.com! If you spend $25 or more (excluding shipping & taxes, after any discounts) you will get a chrome nail polish charm with the KBShimmer logo. 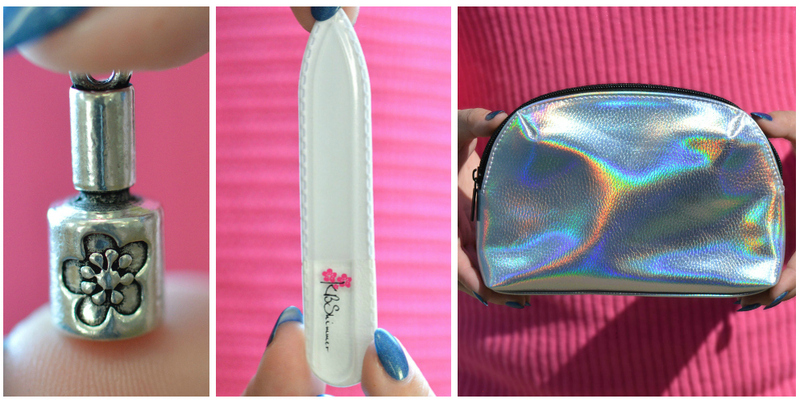 If you spend $50 or more you'll receive the chrome charm, a mini crystal nail file with the KBShimmer logo, and free shipping! And if you spend $75 or more you'll get the charm, nail file, free shipping and a faux leather holographic cosmetic case with the KBShimmer logo! These items will also be available for sale separately on the website. Finally, they have some new limited edition holiday scents available in mani shots, mega shots, sugar scrubs, cuticle creams and lotions: Gingerbread Men, Very Merry Cranberry, and Cocoa And Cookies. I got to try Gingerbread Men and it's scrumptious! Let me know what you think about these shades, I have to say I'm pretty enamored with this collection! The Holy Kale, Royal To A Fault and Take Me for Granite are my favorites. Which ones catch your eye?